Having good time with my Saturn Inflatable Dinghy. HomeBoatsToGo - Blog About Inflatable Boats, Inflatable Rafts, Inflatable Kayaks And More...Having good time with my Saturn Inflatable Dinghy. I live a busy life. I go to work from 8 am to 7 pm every weekday, then come home and spend time with my wife and kids until my gas tank runs dry and I have to go to sleep. On Saturdays, I love to take the family out for day trips, to ballgames, and to any other event we can all enjoy. But on Sundays, I need to relax and recharge. For me, that has always meant getting out on the water for a few hours. Whether that’s to do some fishing, some paddling, or just kick back and have a beer, it’s that "me time" that refills my tanks for the long work week ahead. But for a while, I just didn’t think we could afford the expense of a boat just so I could relax. That was until a friend of mine clued me in to inflatable boats. I went to BoatsToGo.com, checked out their selection, and realized that this was the perfect solution for me. Although BoatsToGo had a wide variety of inflatable boats available, my needs were simple. I just wanted a small inflatable raft that I could take out onto the lake near my house. Because of this, I settled on the 7.6’ SD230 Saturn Inflatable Boat. This dinghy was the perfect option for me, fitting up to 3 people at once (though I usually use it on my own). It is incredibly light weight, so I can carry it all by myself. And if you are not the rowing type, you can easily attach a small outboard motor to it. But for me, I was happy with the free set of aluminum oars it came with. I just paddle out into the middle of the lake, lie back, and enjoy the day out on my inflatable boat! As I said earlier, inflatable boats are very affordable, especially when compared to hard hull boats. And price isn’t the only place you save money. Because you can quickly and easily inflate the Saturn SD230 with the included high-volume hand pump, there is no reason to store it inflated. Just deflate it, place it in its carry bag, and it will fit in your closet, garage, or pretty much anywhere. That means you don’t have to spend hundreds of dollars per month to dock it. You also won’t need a trailer for your inflatable boat, since it will fit easily in the trunk of your car. One of my initial fears when my buddy told me about inflatable boats was that they would easily pop, leaving me stranded out in the middle of the lake. But when I started reading about these inflatable rafts like my SD230, I quickly realized how wrong I was about this. The reasons for that are the cutting-edge design and materials that these inflatable boats from BoatsToGo.com are made out of. For starters, Saturn inflatable boats are manufactured from 1100 denier PVC fabric, giving them amazing resistance to tearing, tension, and breaking. They also double the fabric layers on the tubes, providing even more protection. And if that wasn’t enough, my inflatable boat is built with separate air chambers. That way, if one of those chambers is breached, the boat will still float fine. Thanks to my 7.6’ SD230 Saturn Inflatable Boat, my relaxing Sundays are back and better than ever. 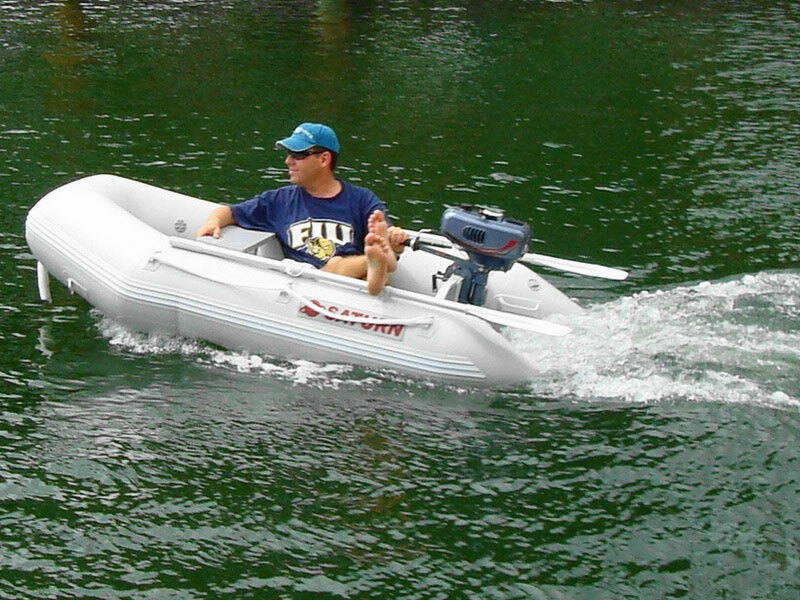 If you want to be able to relax your Sundays away, head over to BoatsToGo.com and find the inflatable boat that’s right for you.